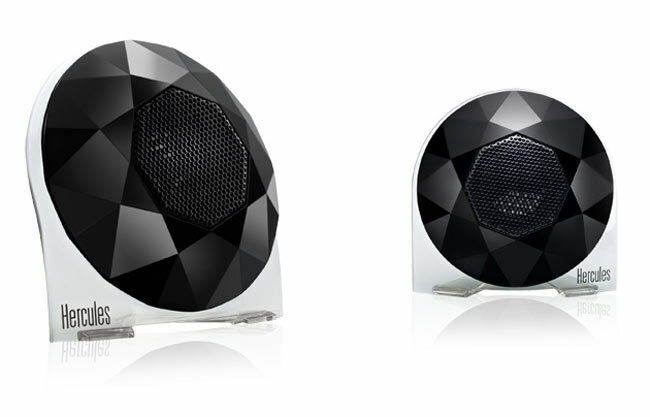 Hercules has unveiled a new line of USB 2.0 speakers it has just launched called the Hercules XPS Diamond. Their name comes from the unique case which gives it the look of a cut diamond, all be it black. The black diamond XPS speakers are mounted in clear stands to give the impression of them floating on your desk. All power and audio is provided to the magnetic-shielded satellites speakers via 1 x USB 2.0 cable and are compatible with both PC and Mac machines. The Hercules XPS Diamond USB Speakers measure just 9 x 6 x 8.5 cm and come with their own black carrying pouch making them ideal for anyone that need to carry a pair of external speakers while out and about.